East Boston, constructed raw from landfill. Built across six islands in the post-war period; now home to shipbuilders, immigrants and a new wave of “young professionals”, artists and artisans. A neighborhood literally built from the ground up. Out of the water. In the 19th century isolated from the mainland because of a lack of transportation — with Eastie accessible only by a paddle steamer, chugging across the harbor — now criss-crossed with high-speed / slow-movement of 21st century access. Cars honk and crawl across Maverick Square. Pick-up trucks of contractors home early to drop-off their kids. Three-generation families out to lunch at Taqueria Cancun for the soup special. The Blue Line, popping up out from underground for a final breath before tunneling out to the airport. The trail of passenger planes departing from Logan rumbling overhead. Oil trucks navigating too-small roads. Construction workers getting shouted at by the job manager on the so fast, yet still too slow, build of over 600 units of new schwanky condos overlooking the water. Teenage boys on BMX bikes hooting at pedestrians as they peel around sidewalk corners on their way to smoke and Facetime with girls on the patio of Italian Express Pizzeria. Circus for Construction launched its fall tour in East Boston. 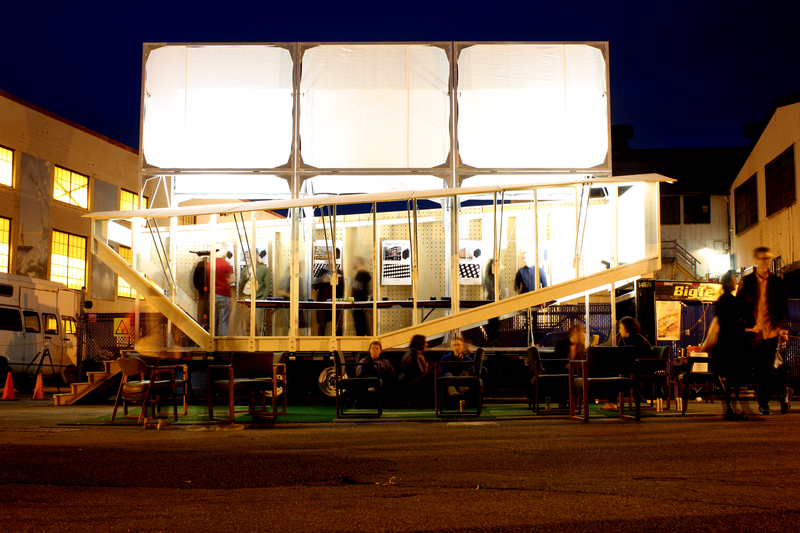 We began with a long search for a space to build our mobile gallery. This search spanned increasingly despairing conversations — and ultimately rejections — from our home universities (MIT, Harvard), art cooperatives, auto mechanics, women renting out their garages on Craigslist, so-called “incubator spaces”, owners of empty lots in Somerville. We at last found at home at HarborArts, in the Boston Shipyard and Marina. 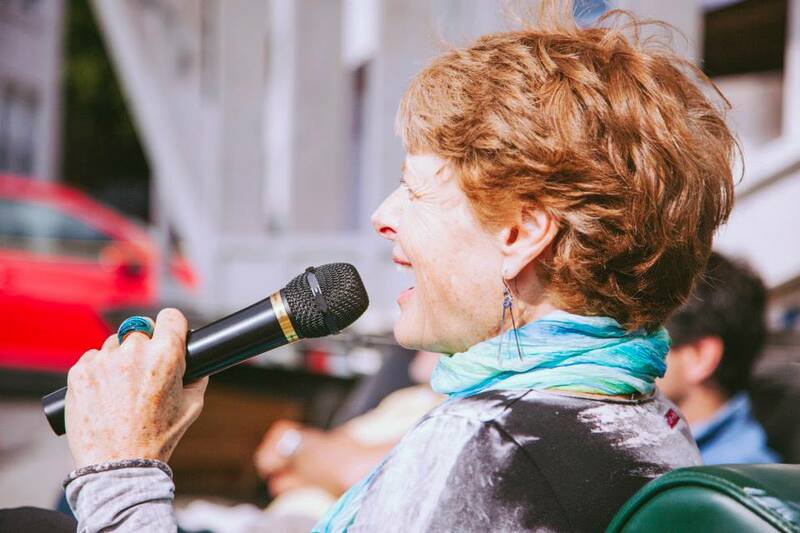 HarborArts, a non-profit in East Boston and home to one of the largest collections of public art in the city, became the construction site and support system. In Building 32, formerly used to sandblast steel, we built the Circus in six weeks. Our neighbors — who construct bridges, ships, racing yachts — peeked in and said hello, shook their heads at our truck driving, offered suggestions. We found our most stalwart ally in Praxis, the fabrication shop of Joshua Kampa, who welded the aluminum frame for our project. On September 20, we hitched the gooseneck of the Circus to our truck and pulled out into the sunlight. The Circus for Construction opening featured two events on the topic of Boston “local.” Both events ultimately complicated and critiqued the term “local,” provoking through questions of speculative design and discourse a less superficial sense of the city. East Boston, in fact, had challenged the Circus’ curatorial idea that a “city” can have some singular identity or direction to exhibit. The neighborhood was radically different from Cambridge, Somerville and the parts of the city we knew before. Michael Lee’s exhibit, “Boston Manual: A Participatory City Design,” engaged visitors to re-imagine their metropolis through custom-made tools. Lee investigated a series of six residential typologies, from single-family house to apartment tower. Each of these types was abstracted and then etched onto a paint roller. 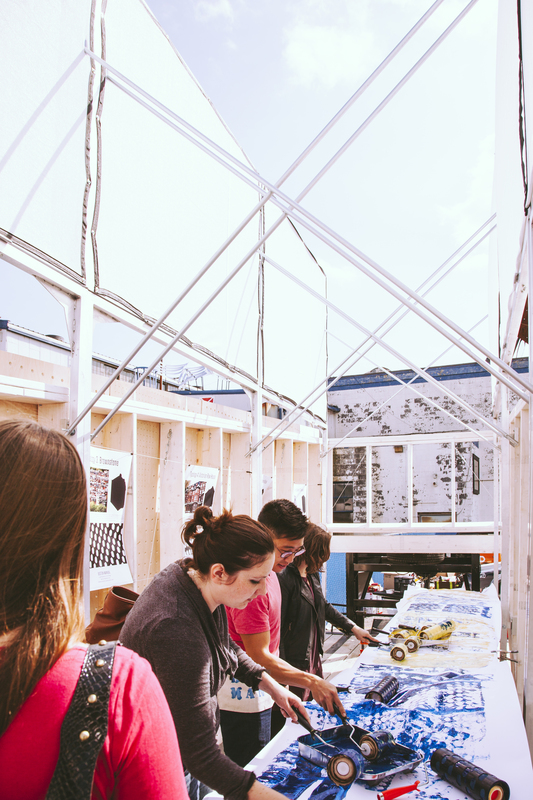 Visitors to the exhibit got a chance to roll out a new urban landscape. Lee’s project provoked questions about city design and its relationship with its inhabitants. 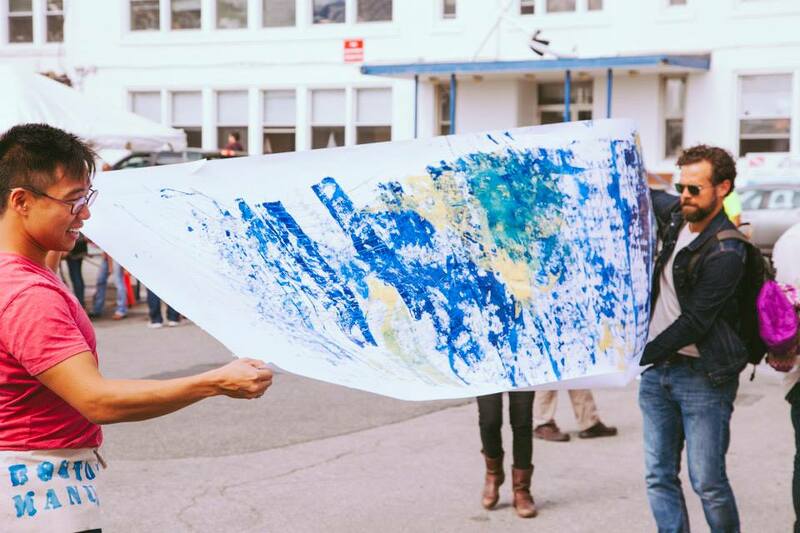 Did the participatory mural perform or echo the agency which, in fact, East Boston residents are fighting for through community meetings and neighborhood groups? Lee’s murals, taken up in earnest by children, who were attracted to the brightly colors and rolling movement, ultimately became a brackish fog of paint. The murals seems to portray city at night, in a blur, with few houses or trees visible at all. What vision of the city was captured in these paintings, created not long in the wake of neighborhood protests against Casino openings, luxury redevelopment, a spreading housing crisis just a few blocks away? 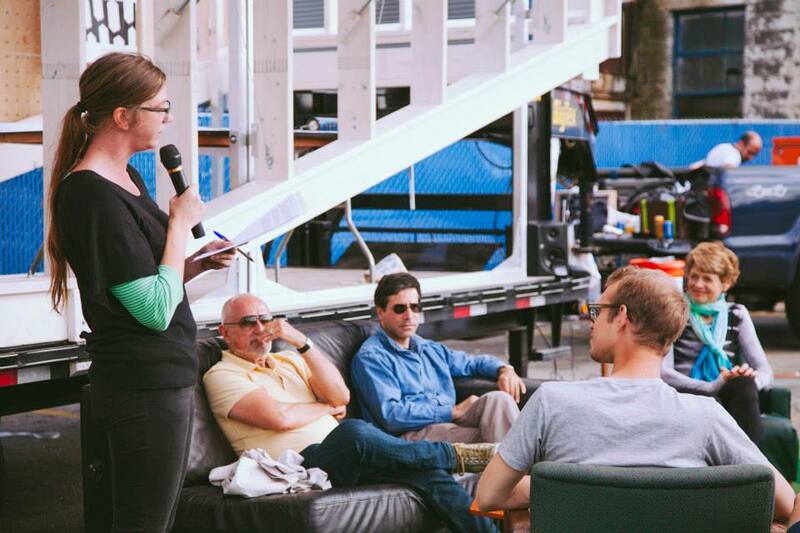 The second event at Circus’ opening was a parlor-style, talk show format conversation led by Jen Krava (Harvard GSD). “Circus Ballyhoo: Local Applications + Global Implications” featured Ron Mallis (BostonAPP/Lab), Greg Galer (Boston Preservation Alliance), and Catherine Widgery, a local artist. Krava mimicked the form of TV and radio gameshows, provoking the speakers through “True or False” stories and “Fill in the Blank quizzes.” Topics which were captured in the conversation included questioning the term local within an increasingly “globalized” world — an idea which Galer challenged, pointing to the rich historical networks made through trade, shipping, communication, preceding instantaneous communication technologies which we colloquially associate with ‘global’ connections. Mallis asked the panelists and audience to choose pronouns carefully, to wonder about the term “we” and who it really represents in situations of urban intervention. Widgery spoke about changing perceptions of the ‘real’, including in the over-saturation of print photography, asking the audience to become more sensitive and aware of our observations. 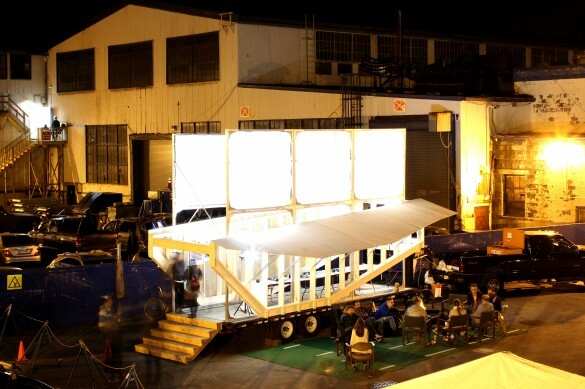 At the end of the evening, we folded down Circus’ double-height space, closed its exterior panels, and pulled back into Building 32 for the night. 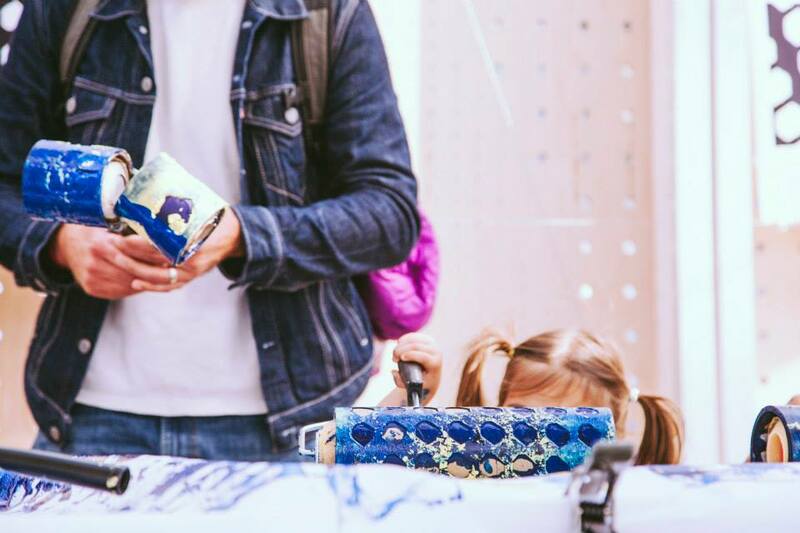 This weekend (October 3-5), it will travel for its first on-the-road trip to Buffalo, NY, continuing the search for local curiosities and gathering them to share out of the back of a truck. The Circus for Construction, a mobile art and design gallery, will hit the road on its inaugural fall season starting September 20. The Circus looks to revive the historic model of a traveling sideshow, which brings unique curiosities from town to town. 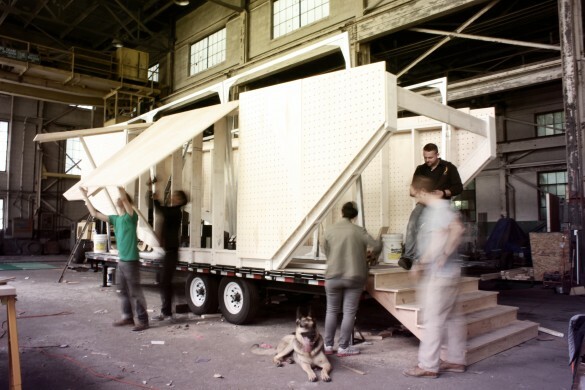 Unlike traditional art galleries, the Circus is a custom-fabricated exhibition and event space on a 25’ long trailer pulled by a pick-up truck. Over the course of three months, the Circus will travel to three cities on the eastern seaboard: Boston MA, Ithaca NY, and Buffalo NY. Events at the Circus will highlight local research and emerging trends, capitalizing on the mobility of the exhibition platform. 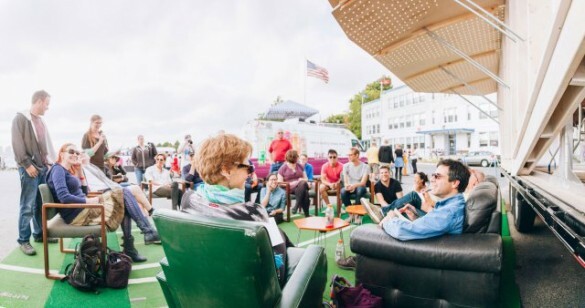 These include lectures and workshops by leading architects, artists and community leaders, such as Ron Mallis (BostonAPP/Lab) on the role of public art in the future of Boston and Joyce Hwang (Ants of the Prairie) on the opportunities presented by outdated zoning codes in Buffalo. Other pop-up gallery events will feature young researchers who seek to provoke a re-thinking about their local contexts, including Michael Jefferson and Sue Lettieri’s research on the response of coastal homes to rising tides and a protest by The Architecture Lobby in advocacy of workers rights in the design industry. 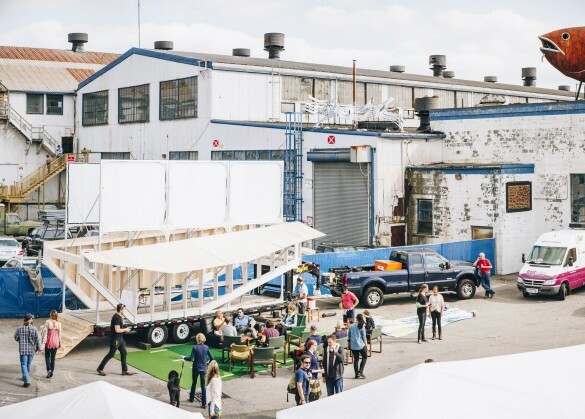 Circus will also participate in the Harbor Arts Festival, in East Boston, and be featured at the Lawn on D, a laboratory for innovative public art and performance. 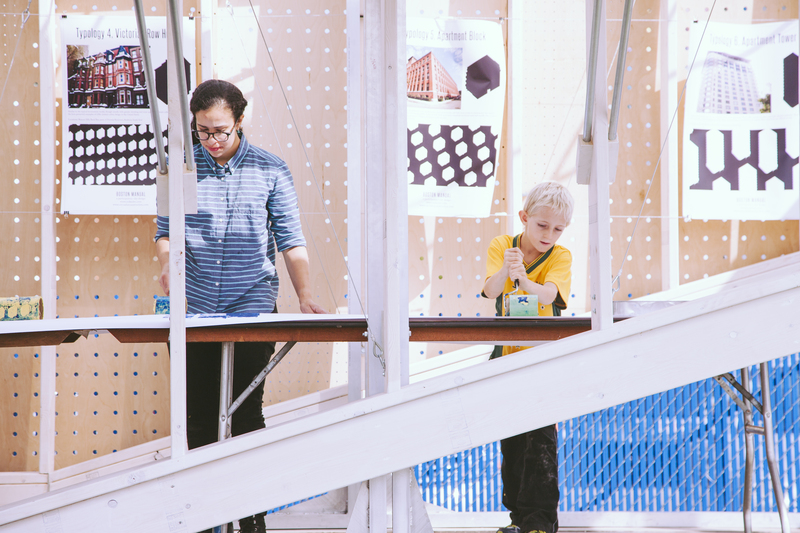 With construction in part financed through crowd-funding, the Circus for Construction represents a public and grassroots desire for a new type of exhibition and event platform. 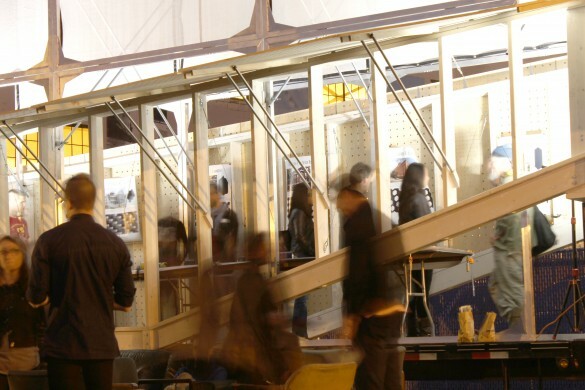 Against the tide of increasingly entrenched brick-and-mortar institutions, the Circus is the brainchild of young designers who believe in the potential of temporal, heterotopic, self-built spaces to radicalize how we perceive art and architecture.